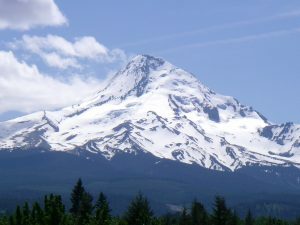 The Columbia River Gorge Waterfalls Tour is usually combined with a “loop” around Mount Hood, Oregon’s tallest mountain. This tour is normally scheduled from 9 AM to 5:30 PM. The following is a sample itinerary. Due to road closures and winter conditions the itinerary of this tour may be altered. Call for details. Full day $99.00 each. Group discounts available for 30+ guests. 9:00 AM Pickup at your hotel or location. Head east to the sea-level, 4,000-foot-deep Columbia Gorge, which cuts through the Cascade Mountains by the Columbia River. 9:50 AM Stop at the historic Vista House for a spectacular thirty-mile view of the river and a rest stop with interesting historic photography and native wildflower exhibits. 10:20 AM Head further east on the “Old Scenic Highway” while you learn about the history of the first mountain highway of the west. We’ll stop at several waterfalls with interesting names like Latourell, Wahkeena, Multnomah and Horsetail for short walks or longer hikes (you choose), quiet reflection and photo opportunities. 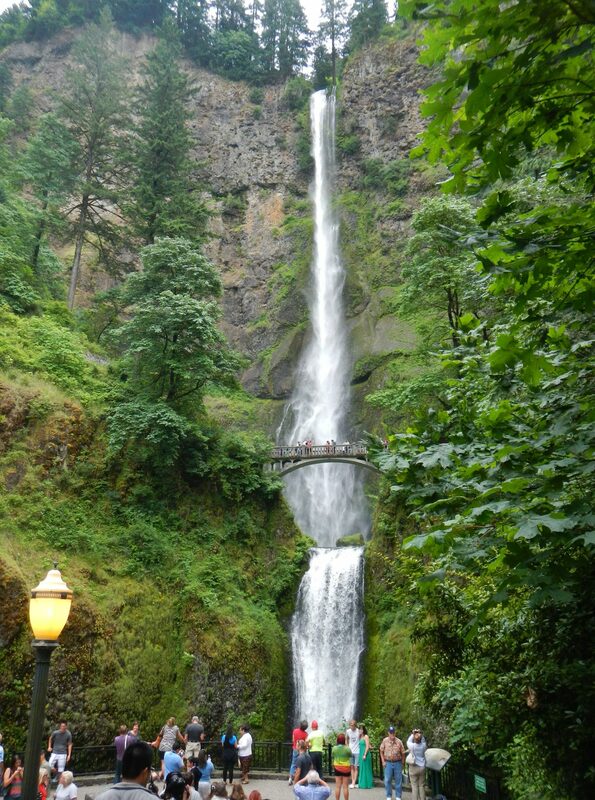 11:00 AM Guests always enjoy the visit to Multnomah Falls, Oregon’s most famous and tallest waterfall at 620 feet. EcoTours will provide plenty of time for you to enjoy the ten-minute walk up to the Benson Bridge between the lower and upper falls for views and photos, and to visit the Nature Center and Gift Shop. 11:30 AM Still heading east, we’ll discuss the life cycle of Pacific Northwest Salmon en route to the Bonneville Dam, where we may see migrating adult salmon through the fish-viewing windows and in the fish ladders. 12:30 PM Lunchtime will be spent at Hood River, “the windsurfing capitol of the U.S.A.” We’ll drive you through the downtown area and point out some of our favorite restaurants, then leave you on your own to eat and look and browse through this quaint, compact town. 1:30 PM After lunch, we’ll head through the picturesque Hood River Valley stopping at a local fruit stand to sample locally-grown cherries, berries, pears and apples. While climbing Mount Hood’s southeast flank, you will learn about Oregon’s diverse ecosystems as the scenery changes from the dry eastside Cascades featuring ponderosa pine forests, to the lush westside forests of Douglas fir, cedar and hemlock. Many guests enjoy an optional stop to see a portion of the original Oregon Trail as we continue the drive to the high alpine forests of Mount Hood’s upper elevations. NOTE: If road conditions get dangerous in winter, we may not make it into the higher mountain areas. If this happens, we will take the guests up to the snow and then head back for more sightseeing in the Eastern Columbia Gorge area. 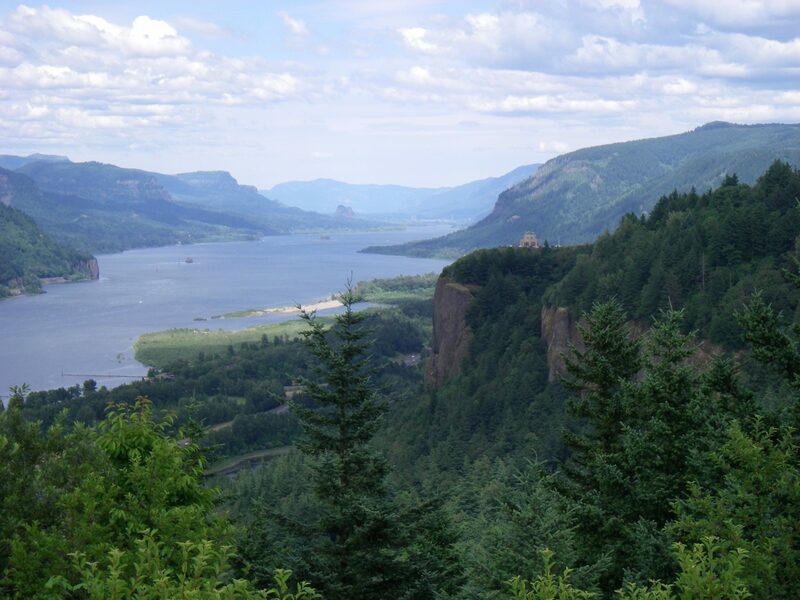 The Eastern Columbia Gorge area offers beautiful dry desert mountain views and historical areas. We may possibly cross the Columbia River into Washington state for additional terrific photo stops. We finish the tour at about the same time if we follow the alternate winter itinerary (5:30 PM). 4:00 PM On our drive back to Portland, we’ll pass through beautiful mountainous terrain and quaint small towns into the fertile agricultural fields of the Willamette Valley. 5:30 PM Arrive back at your hotel or home. 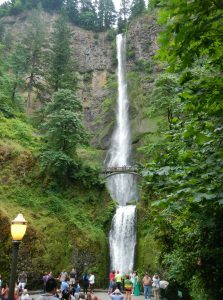 The cost of Columbia River Gorge Waterfalls day tour is $99.00 each. Cost includes door-to-door transportation and the interpretive naturalist services of your ecotour guide. We may reverse the direction of this tour depending on traffic flow. Group discounts available for 30+ guests.